Mason jars make great containers for holding all kinds of little odds and ends. They also are wonderful to use as vases. I have used clear jars in this way several times. However, this mason jar vase is a little different. 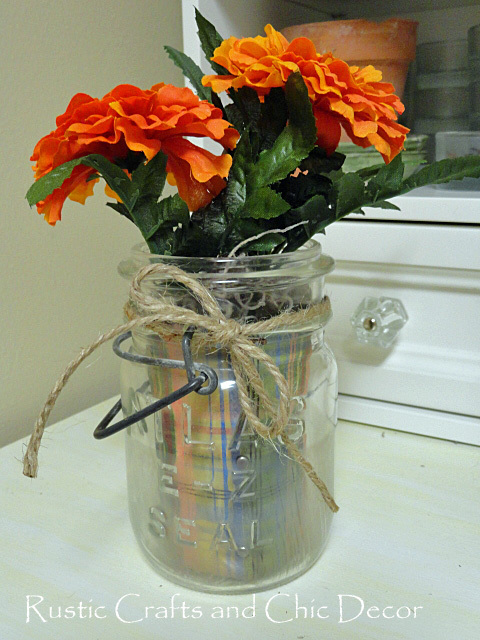 You may have seen colorful mason jar vases that are painted on the inside. When the jar is painted on the inside, the glass provides a nice glossy finish. You have to be a little careful about what you put inside, however, so that you don’t scratch the paint. My idea for a colored jar is a little easier than painting. You also don’t have to worry about the inside getting scratched. Instead of painting the inside of the jar, I came up with an idea to use craft paper. A patterned craft paper adds a little more colorful interest for a vase and is super easy to make. All you need is a mason jar, fun patterned craft paper, some Spanish moss and artificial flowers. 1. 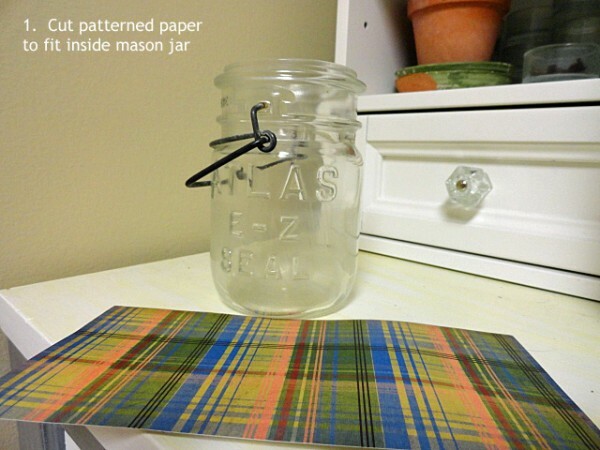 Cut patterned paper to fit inside mason jar – measure the length that you want the paper to fit from the bottom of the jar to about the bottom of the neck. The width should be a cylinder that fits into the opening of the jar plus about 1/4 inch overlap. 2. Make a cylinder out of the paper – put a bead of tacky glue along the outside edge of one side of the paper. Overlap the other side of the paper about 1/4 inch and press until glue holds. I added three brads for extra hold and for a decorative embellishment. 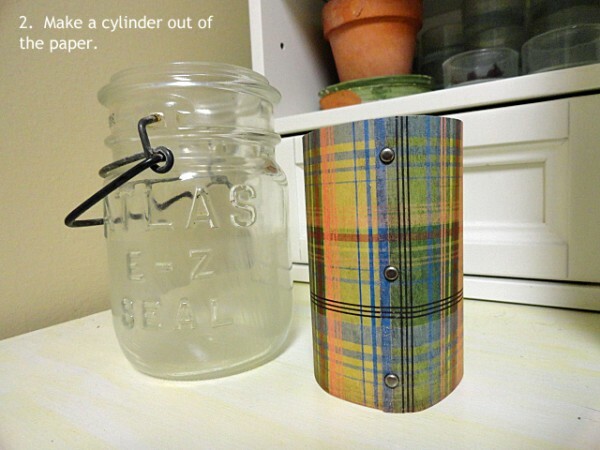 Slide the paper cylinder into the glass mason jar. 3. 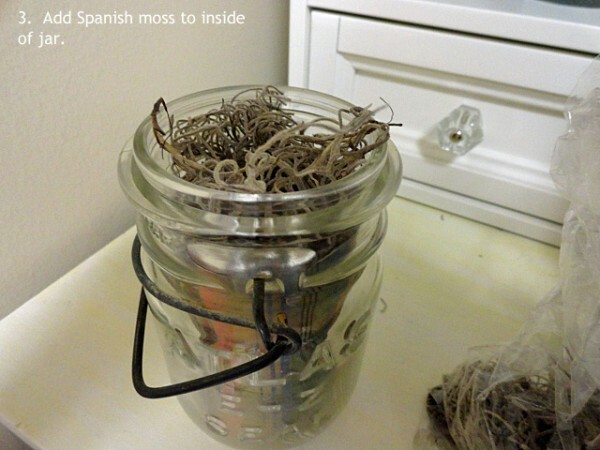 Fill the mason jar with Spanish moss – this adds a nice base to hold flower stems and also covers the white background of the paper. Now, just add a couple of flowers and tie some jute string around the neck for some added flair! My jar was a bit permanently cloudy from age so the plaid does not show up as bright at the bottom. A new or clear jar will show the paper more brightly. For more mason jar projects, see my post on unique mason jar crafts.